We’d discovered a great place to park when attending the Gold Cup meeting last year so we went for a repeat. I can’t tell you where it is exactly otherwise there would be no space for us to park next year! But I can tell you the general principle. We parked about a mile from the track and walked down the hill. The traffic was moving so slowly that we walked the mile in roughly the same time as it would have taken to drive, chatting to drivers stuck in the slow moving traffic. It would prove even more of an advantage on leaving the track (aside from the up hill walk) because the car parks would be congested and it would be a nightmare trying to get out. Cheltenham had not gone well for me up to this point, I’d had a winning first day but then it had all gone pear-shaped on Wednesday and Thursday. It’s the one meeting of the year where I usually get a bit carried away and involve myself in more races than I should. But ever the optimists, here we were with some tremendous racing and betting opportunities ahead. I didn’t have a strong view in the first, the Triumph, but opted for Olofi which showed up early on but faded to finish ninth. I was rather disappointed that Barizan didn’t win given the bold riding tactics. The jockey stole three lengths at the start and went about 20 lengths clear at one stage. Still 15 lengths clear two out he hit the last two and was only just run out of it close home. In the second fortunes improved a little. I’d backed Dee Ee Williams each way at 33s in the morning – just following a Pricewise recommendation to be honest. It went off at 20/1. At the top of the hill I thought it was going to win – it led two out – running on reasonably well to take third for a welcome 8/1 return on the place bet. Thousand Stars won the race, a second festival winner for the delightful Katie Walsh. After the second race we were invited into the Betfair marquee for a drink. (Betfair is one of my former employers). This was like being in heaven! Delicious food offered to you every few minutes, plenty to drink, huge TV screens and Betfair betting facilities on hand. Plus, should you back a loser; there was a team of masseurs to provide a neck and shoulder massage to ease the pain! There were quite a few people associated with Manchester United there – Sir Bobby Charlton and Andy Cole were two whom I recognised. After all the hospitality excitement we missed the third race – which was just as well as it was won by unconsidered (by us) Berties Dream at 33/1. Next up it was the big one! 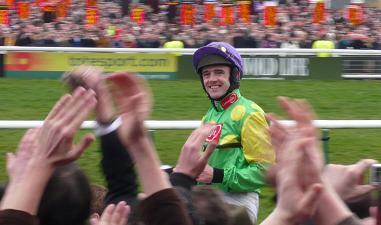 The so-called show down between previous winners Denman and Kauto Star. Having attended the LRC Cheltenham preview night I’d backed Tricky Trickster both each way and also without the big two, as this was strongly recommended by some members of the panel. What a disappointment he proved to be. Never ever sighted and completely tailed off at the finish. Fortunately that was not my only bet in the race. On Wednesday the weather forecast was heavy rain to arrive by Friday morning. As a result I backed Mon Mome each way at 150/1 in the hope that the rain would arrive and make the race even more a test of stamina. As it happened the rain was a bit too late only arriving about 20 minutes before the race. The going was good, good to soft in places and therefore not as soft as I’d hoped. As Imperial Commander and Denman came down to the second last I could see Mon Mome about 50 lengths further back in sixth or seventh place. Of course I’d written off the bet at that stage. Adrian was praying for Denman not to win as he’d made it his “Lay of the Day”. Incredibly Mon Mome finished like a train up the hill to go from fifth to third near the line. When they passed the post I turned to Adrian and said, “Damn it he’s finished fourth”. But then the announcement came “Third No. 8 Mon Mome”. So the winner had beaten my selection by 30 lengths but I was going to pick up a tasty place bet at 37.5/1. A short-head. Incredibly by this margin my festival had turned from a losing one into a winning one. Poor Ruby however was on the deck. What a difference to last year. More success in the Hunters’ Chase as we’d both backed Baby Run at 7/1(returned 9/2 joint fav) and what’s more Adrian had laid the other joint favourite in the race. Small (losing) interests in the last two races but overall a fantastic day out – great to be part of the 67,716 attendance – and a winning festival. Long may that continue!